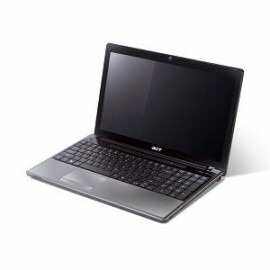 Acer Aspire 5553 Laptop come with Win 7 Home 64-bit , AMD Turion™ II Dual-Core Mobile Processor P540, 4GB DDR3, 320GB hard drive, Acer CineCrystal 15.0″ (1366 x 768) TFT display, ATI Mobility Radeon™ HD 5470 graphics. The Aspire® 5553 presents animated multimedia performance with dynamic sights and sounds. A powerful AMD™ mobile processor combines with amazing ATI™ graphics and high-definition technologies to take you right where the action is. This slick notebook also features excellent wireless connectivity for staying in touch wherever you go. ATI Mobility Radeon™ graphics look stunning on the 15″ high-definition wide display. Bring Dolby® Home Theater® into the mix and you’re all set for a full-on portable-cinema experience. The HDMI™ port conveniently connects you to today’s hottest high-definition entertainment systems via a clean, single-cable link. A powerful AMD™ processor speeds up your multitasking pace, while DDR3 memory keeps the system moving swiftly for efficient performance. Feel free to transfer, download and store media files thanks to this notebook’s four USB 2.0 ports, multi-in-1 card reader, and large hard disk drive. The Aspire® 5553 features onboard Wi-Fi® bolstered by Acer® SignalUp wireless technology for getting online faster and more dependably wherever you roam. Gigabit Ethernet is also on tap if you’d like to go the high-speed wired route. You can also conveniently engage in live chats with friends across the globe using the built-in high-definition Crystal Eye webcam plus microphone. The Aspire® 5553 features a FineTip keyboard with numeric keypad and large keys for comfortable typing, while dedicated media keys give you total control over your entertainment. Another special highlight is the multi-gesture touchpad that lets you easily scroll, pinch, rotate and flip through web pages, files and images.